Recently we sat down to talk about ballet conducting as a profession: what it entails, why it is often misunderstood, and how it has sustained him as an artist for nearly four decades. CD: Tell me how you got started in the dance world. JM: For my final student concert at Juilliard, I conducted the Juilliard Orchestra at Alice Tully Hall in Lincoln Center. Martha Graham attended that concert and invited me to tour with her company, which concluded with six weeks at the Metropolitan Opera House. In the fall Mr. Balanchine saw me conduct at the Met and said, “Would you like to do Nutcracker in November?” So there I was – doing ballet and having a great time. The season after I graduated, I was asked to return as guest conductor for the American Opera Center at Juilliard. During the rehearsals the president of Juilliard asked me up to his office and said to me, “I hear you’re conducting for ballet.” Being the only recently graduated Juilliard conductor who was working at the time, I thought he was going to be thrilled for me, but he said, “You’ve just thrown away a very promising conducting career. I’m really disappointed.” I was totally devastated. It took me years to get over it, but I just concentrated on the fact that I loved what I was doing and the people I was working with. A whole new world of artistry in music, dance, and theatre had opened up for me. CD: From what I can see, there’s uncertainty among music professionals about whether ballet conducting is a legitimate enterprise. One dance conductor has said, “[Balanchine] was such a great musician [that] … we can often stick our heads down and deliver a performance that has no compromise. (Rosalyn Sulcas. “Dance Conducting: Good for the Nerves, If Not the Career.” New York Times, June 25, 2006. http://www.nytimes.com/2006/06/25/arts/dance/25sulc.html?mcubz=3). Why would anybody want to conduct for dance with their head down? Also, having your head up means you are part of that other performance – the one onstage. And, as Martha [Graham] said to me, “What’s the one thing that musicians and dancers have in common?” Her answer was they all breathe. CD: The notion of breathing as the bridge between music and movement gets us to the heart of the matter, which is, that many symphonic conductors believe that music played in a concert-hall setting must, by definition, be better and more true to the intent of the composer than music played for the ballet. JM: I would only agree with that if you can tell me that every performance of Beethoven’s Fifth sounds exactly the same regardless of the conductor and the orchestra. The variety of interpretation shows that music has the ability to express the composer’s wishes in a flexible way. When a piece of choreography is married to the music, it can enhance the composer’s creation. For example, Martha Graham’s Acts of Light is set to music by Carl Nielsen, and ends with the Helios Overture. In it, music and dance were so well matched that the dancers’ final movements created the illusion of a note that wasn’t there, heightening the dramatic tension of the performance. 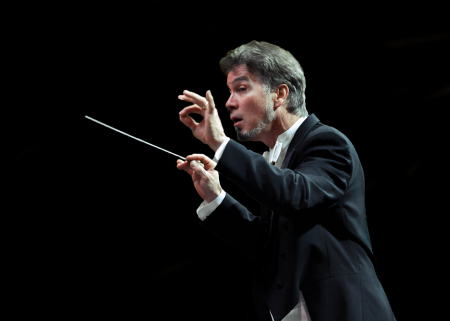 CD: According to the late James DePreist, former director of conducting and orchestral studies at Juilliard, “ … there has been and continues to be a general bias against conducting for dance …. the fact that you are not able to exercise your creativity counts … against you” (Sulcas, “Dance Conducting … “). For him, I suspect that even music written for the ballet would be better off without dancers. JM: Well, that would negate the purpose the music was written for. If you really believe what he said, don’t buy a ticket to the ballet. CD: All this recalls something Tina Fey (channeling Sarah Palin) said on Saturday Night Live: “Don’t think I don’t tolerate gay people. Because I do. I tolerate them with all my heart.” I get the feeling that some conductors feel the same way about dancers. CD: I know that you have slightly different versions of the music for different soloists. Some people believe the only reason for making such changes is to compensate for the dancers’ inadequacies. JM: There are those who think there’s only one right way to play the music. That’s ludicrous. Live music allows for the subtle adaptations required for soloists, who have different body types and styles of movement. They, in turn, express their individuality through their phrasing. Of course, in corps dances uniformity is a must, but the musical structure and movement vocabulary they’re based on is less complex. What we aim for with soloists is a partnership like that of a conductor and solo instrumentalist, which is based on mutual trust. I remember that when guest artists came to Boston Ballet, they tended to be wary of me at first because they were afraid I wouldn’t give them what they needed (especially in the classics), so they danced carefully. I have gone through this with many dancers from Carlos Acosta to Nureyev. Once they knew I was there to support them, the working relationship was transformed; they opened up, took chances, and just danced. CD: Speaking of alternative versions, soloists have often given me insights into the music that I wouldn’t have had otherwise. One example happened last season when Boston Ballet (BB) did The Sleeping Beauty (the Ninette de Valois production after Sergeyev’s 1939 version with additional choreography by Ashton). As Aurora, Ashley Ellis performed the renverses of the Rose Adagio with such intensity that she looked as if she was already caught up in the whirlwind of the spell that was about to descend on her. There’s a big crescendo at that moment, and I began to hear it as the foreshadowing of Aurora’s destiny. JB: That’s the genius of movement. Sometimes you get a dancer who will intuitively turn a gesture into something you didn’t anticipate. As an audience member, you read something into Ellis’s movement; you saw Aurora’s helplessness in the face of what was to come. The question is what is the impact of what’s happening onstage and what is its relationship to the music? I was fortunate in the first part of my career to work with some of the real giants in our field, who would take the time to come to me and say something like, “That’s good, but if you just hesitate a little more, it adds something the dancer can use” – and musically it works. CD: One critic has observed that “an attuned ballet conductor … may hold an entire orchestra at rest for a dancer’s spectacular balance … “ (K.C. Patrick. “Music: It’s About Time,” Dance, July 2001. https://www.thefreelibrary.com/Music%3A+It%27s+About+Time-a075753716). What’s involved in accommodating dancers’ bravura moves? JM: First of all, “rest” is the wrong word because it means the action has totally stopped. Since the performance is continuing, the correct term is “pause.” In classical ballets such pauses, for balances or extra turns at the end of a variation, are traditional even though they’re not actually written in the score. They do not happen on the spur of the moment. The conductor, dancer, and ballet master discuss and rehearse them, although I’m aware that adjustments may have to be made during the performance. The greatest challenge for the conductor is achieving a synchronized ending. If the dancer is doing a balance, such as Giselle’s Act II arabesque penchee, I watch her breathing, which changes when she’s about to come out of it. If the dancer is turning, as in Odile’s fouettes, I watch her back for the tensed muscles that indicate when she’s about to stop spinning. Many conductors work according to set counts; I just eyeball it and rarely miss. That’s why I keep my head up – so I stay in touch. CD: What happens when a dancer throws you a curve ball? In Act III of the last BB performance of Sleeping Beauty I saw last season, the prince anticipated his cue and went flying off into a series of barrel turns. JM: I’ve conducted different versions of Sleeping Beauty for over 30 years and watched many other productions, and I have never seen anyone do barrel turns at that point. It’s supposed to be a manege [circle] of grand jetes. When that happened, I went, “Holy Crap!” and I had to speed up because the tempo I was at would not work for barrel turns. The dancer was feeling really exuberant and just decided to do them. It was definitely exciting! CD: That shows how attentive you have to be to what’s going on onstage and how vigilant and flexible the orchestra has to be throughout the performance. It also shows that you have the same kind of collaborative relationship with the musicians that you do with the dancers. As former Boston Ballet Orchestra (BBO) principal harpist Cynthia Pryce-Glyn put it, “You can’t rely on how you rehearsed [the music] or how you practiced it” (“The Faces of Boston Ballet: Jonathan McPhee” https://www.youtube.com/watch?v=09q2ipGO8Ic). JM: My teacher at the Royal Academy once said, you can be a fine symphonic player and be a disaster for opera or ballet. 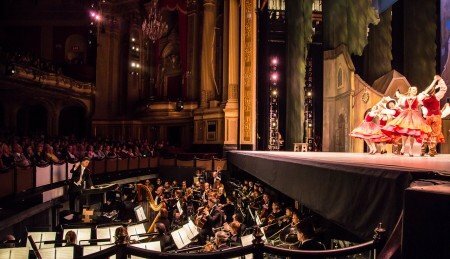 It wasn’t until I started conducting for the ballet that I realized there are players who should not be in the pit. In a really fine ballet orchestra, such as the BBO, the musicians understand that there’s a lot that can change in different performances. So the players have got their eye on the conductor all the time. If I have to push the tempo for a dancer; it might take a little longer for a symphony orchestra to respond. The BBO was so in tune with me that if I needed just a little gradation of change, I got it. It takes a while to build up a relationship like that. When BB was in London, we didn’t bring our own musicians with us, and I chose to perform with the Royal Philharmonic Orchestra. We were doing Balanchine’s Serenade [set to Tchaikovsky’s Serenade in C Major for String Orchestra]. Usually the opening is done in six [beats per bar], but Balanchine wanted it done in two. It’s andante non troppo, after all, not largo. I conducted it in two, and the orchestra would not follow me. I said to them, “Look, you’ve all played this a million times. You’d sound great playing it even without a conductor, but this is a ballet, and Mr. Balanchine had a different idea. It’s more spontaneous, and it moves.” After that, the musicians were willing to try it, and by opening night, they told me they loved playing it the new way. I also had a problem with the fourth movement of Serenade (allegro con spirito), which Balanchine made the third movement of his ballet. When I first started conducting it for Dance Theatre of Harlem, I found that Balanchine wanted this movement to be played much slower than I was used to, and I couldn’t make it work because it felt draggy. When I finally asked Balanchine about it, he told me that it was folk music, which should not be played too fast because it’s meant to be danced to. After that, I saw what he heard: accents in the off-beats that make it sound like Russian folk music. CD: It wasn’t tempo so much as accents? CD: So tempo is involved, but it doesn’t define what you do. JM: Tempo is a brick. Is that brick going to become a building? Is it going to become a road? I think people try to oversimplify it, thinking they’ll make it easier to understand, but it’s very complex. 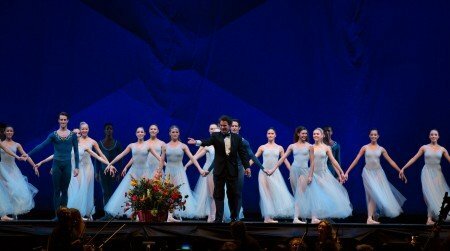 There is a whole universe of considerations that have to be taken into account in order to make informed decisions about the tempo and character of the music, including the dancer’s preferences, strengths and weaknesses; choreographer’s concept; composer’s intent; historical period of the ballet; musicians’ input, especially when there’s an instrumental soloist; and company style – New York City Ballet, for example, tends to move on the front half of the beat and the Royal Ballet on the back half. CD: Why is there this desire to oversimplify? Why not admit all the relationships and subtlety involved? JM: It takes a lot of security and confidence to say, “I don’t know everything.” When I was working with National Ballet of Canada on Sleeping Beauty, one of the ballerinas asked me if she could have her entrance faster. I wanted to understand her reasoning, and she explained, “It’s my coming-out party. My heart is racing, and I’m all excited.” She wanted a breathless, slightly uncomfortable quality in the music, and that had to do with her interpretation of the character rather than a simple increase in speed. It worked for her and was convincing. CD: One ballet pianist has said, with his tongue firmly in his cheek, “There are only two tempos, too fast and too slow.” Then he added, “My job … is to make the middle sound like that’s the way the piece should go” (Marina Harss, “Finding the Keys for the Right Ballet Steps,” New York Times, January 13, 2016. https://www.nytimes.com/2016/01/17/arts/dance/finding-the-keys-for-the-right-ballet-steps.html). What do you think of that? JM: One tempo does not fit all. What’s important is how you lead the listener from point A to point B and make it seem as if it’s inevitable. When the transitions are seamless, the music disappears, and the audience is only aware that the dancing is amazing. CD: So it’s not about finding a middle ground, and it’s not about making “compromises,” as some conductors believe (Marina Harss, “They Help You Listen With Your Eyes,” New York Times, August 1, 2017. https://www.nytimes.com/2014/08/03/arts/dance/dance-conductors-keep-watch-while-they-keep-tempo.html). In the collaborative arts, it seems to me it’s not a question of compromise but of making conscious decisions for the good of the performance. CD: That invokes the idea of the pit and stage as a war zone in which the conductor has to represent the interests of the composer because the very presence of dancers does damage to the music. JM: That’s nonsense. The higher the quality of the dancers and the wider their technical range, the more expressive the conductor can be. Most people don’t realize how important Martha Graham was to the music scene. They forget that she commissioned Appalachian Spring and that Agnes de Mille commissioned Rodeo; both pieces came about because of choreographers. CD: What are some of your main concerns in trying to explain what ballet conducting is about? JM: First, is to get away from the idea that it’s musically demeaning to do ballet. Second, is to say that there’s something in collaborative art forms that can illuminate music in ways that you might not have considered before. Sometimes the visual element will cause you to focus on some aspect of the music – it may be something that doesn’t seem significant at first – but suddenly that focus will make you think about the music differently. 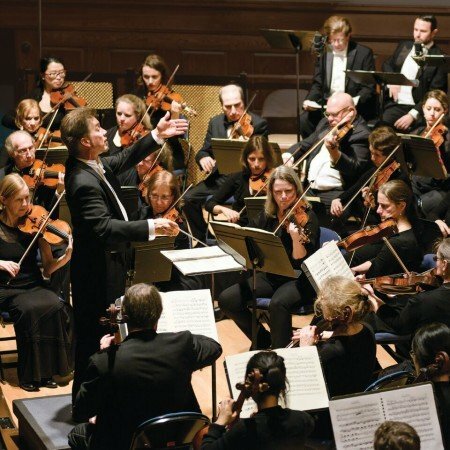 In the symphonic world, the conductor’s vision determines how the music will be interpreted, but really fine conductors leave room for individual musicians to have some artistic say otherwise they’d feel stifled. Just as a symphonic conductor allows the orchestra members a certain degree of artistic input, ballet conductors do the same for the choreographer and dancers – as well as the musicians. You can’t say there’s something of value to be added by musicians, but not by the choreographer or dancers. CD: You’ve said that Prokofiev’s Romeo and Juliet is more powerful as a ballet than as a concert-hall piece. Why is that? JM: The choreography gives you more artistic input to take in, and science has proved that human beings respond most strongly to the combination of visual and auditory stimuli. In Act I of the Cranko version, for example, as soon as Lady Capulet presents the ball gown to Juliet, the death music from Act III is heard. Cranko created that link between the dress and the impending tragedy through Prokofiev’s music. He ends Act I with Juliet holding the dress up to her chest and looking out into the audience. At that moment, [former BB principal dancer and current ballet master] Larissa [Ponomarenko], as Juliet, communicated that her fate was sealed. For me as conductor, doing that passage with her was so moving. Onstage was a human being who had internalized the meaning of the music; she was looking at me, and I was looking at her, and we were creating something together. One felt a shock of recognition that might not have happened when listening to the music alone. CD: That makes me think of a problem I had with Ashton’s Cinderella. I couldn’t understand why the ballerina had that squared off, clock-like look in her Act II variation. Then I heard the tick-tock in the wooden block that is taken up by the pizzicato in the strings, and I realized that Cinderella is telling the prince that she is under a spell and being controlled by the clock. It’s all in the music, and only Ashton heard it that way. JM: And now every time you hear the music without the dance, that interpretation will stick in your head. You will hear the tick-tock where most people don’t. That points up the complexity of this whole thing. There’s so much in a piece of music that can be explored and can benefit from the collaborative relationship between dancers, choreography, conductor, and musicians. CD: Another example is in the Act II pas de deux of the BB production of Swan Lake (choreography by Mikko Nissinen after Petipa and Ivanov). I was wondering when Odette first makes a commitment to Siegfried. Then I realized that at the moment when she walks away from him, the melody goes from the solo violin to the cello. The music indicates a shift in their relationship, but without seeing her actions there’s no way to know that she distances herself from the prince and then chooses to return to him. JM: I try not to lock down on a single interpretation, but yes, when the cello takes over, that resonates for me. If you didn’t have the drama in front of you, it would just be a change of orchestration, which aids in development of the thematic idea, but a talented choreographer can add more layers of meaning through visual interpretation. CD: To sum up: ballet conducting allows for creativity, offers you insights, gives you musical options you might not otherwise be aware of, and broadens your horizons rather than narrowing them. It does impose certain restrictions, however. JM: There are frameworks that wouldn’t exist if you didn’t have the visual element. When composers receive a commission, many of them find they’re actually helped by knowing exactly what restrictions will be imposed on them. Stravinsky used to say that he never got excited about writing a piece until he got the contract. It wasn’t about the money; it was that the contract would give him the parameters within which he would work. The three Tchaikovsky ballets are so fascinating in this regard. He and Petipa were supposed to team up for Swan Lake, and then Petipa got sick. So Tchaikovsky, on his own, wrote this enormous symphonic score that nobody knew how to choreograph because it was light years ahead of its time – huge mistake. In Sleeping Beauty he went back to the old methodology in which he worked in conjunction with Petipa. Because of that, Tchaikovsky was able to stay within the framework that worked for the choreographer while vastly improving the quality of the music. CD: So while ballet conducting has to take cognizance of certain restrictions, it is not artistically restricting to its practitioners. JM: Those who say it is are oversimplifying, and that doesn’t do justice to ballet either musically or in terms of dance. It appalls me. You would not believe how many times I have heard a dancer say to a conductor, “You have to go much faster,” and then the conductor overcompensates by jacking up the tempo, which makes the music completely undanceable. In my experience there’s usually an underlying problem, which is that the dancer needs to finish a phrase on a certain beat and can’t make it work. In rehearsal what I will do in a case like that is steal time, in a musically tasteful way, from measures before that point, using “tempo rubato” (which literally means “stolen time”) without increasing overall speed, so that the dancer and music end up in sync. During a performance what the audience perceives as incorrect tempo is actually a mismatch between pit and stage. That can be caused by any number of factors, including insufficient rehearsal time or issues related to the conductor such as lack of background knowledge, miscommunication with dancers and other artistic personnel, inadequate engagement with what’s happening onstage, inflexible timing, or misguided attempts either to make the dancers more comfortable or push them beyond their limits. “Tempo” is a deceptively simple term for something that’s actually multi-dimensional and intensely dynamic. After spending my career learning to master the subtleties of how to marry music and dance, having the whole enterprise reduced to the simplistic notion of speeding up or slowing down is disheartening. I’m like Tchaikovsky, I believe in the art form.